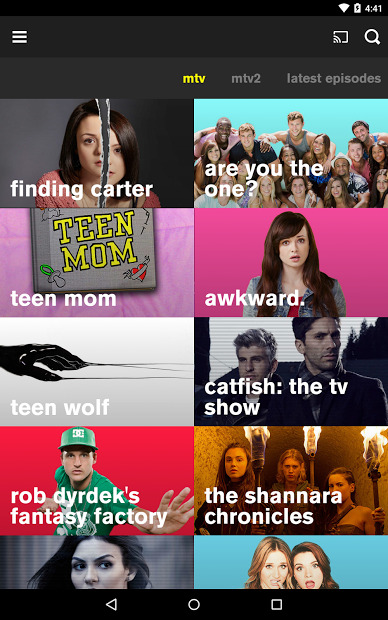 With the official MTV app you can watch their shows anytime, anywhere from your Android device. You won’t need to sign in to be able to watch tons of great videos from MTV shows, including select full episodes, sneak peeks, after shows, bonus clips and exclusive, original content. If you sign in with your TV provider, you can watch recent episodes from current MTV series including Teen Wolf, Finding Carter, Teen Mom 2, Awkward and more. Also you will have access to MTV Video Music Awards and the MTV Movie Awards, and watch real-time livestream coverage from music festivals, San Diego Comic-Con and other events! Note: Only available on some countries.